pinch-free. st. patty's. day. outfits. - bitte.und.danke. Don’t have a St. Patrick’s Day outfit planned out yet? Say no more! Whether you’re looking to dress in head-to-toe green or are all about those subtle pops of mint, scroll down for three green (and pinch-free!) #OOTDs that can be styled with almost zero effort. When in doubt, mix in green accessories that exude your personal style. Start with a trusty striped dress and then proceed to add in a kelly green satchel (loving this one from Cambridge Satchel Company! ), a pair of mint sandals and some sparkly green bejeweled studs. If you’re not so keen on wearing all-green-everything, then you can just pick one attention-getting accessory to keep the pinches at bay. Dress to impress with this preppy outfit that you could wear to class, work and beyond. Celebrate the arrival of spring (this Sunday!) by incorporating some throwback floral into the equation. This Brady Bunch-esque button-front skirt (with hints of mint + lime) can be teamed with a white scalloped blouse and a cardigan/denim jacket/field jacket depending on the weather. 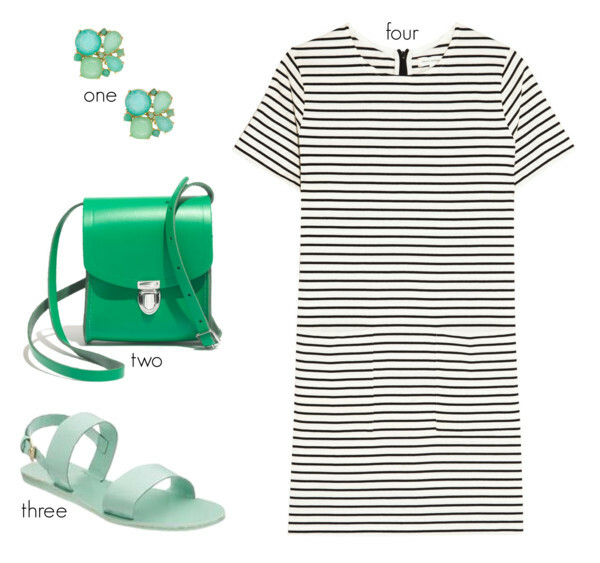 For an extra dash of green, try working in an emerald cross-body bag, mint flats and/or fluorescent green nail polish FTW! Non-green enthusiasts, I hear ya! Rest assured that you don’t have to love shamrock green to avoid the pinches on St. Patty’s Day. Enter an army green jacket that won’t cramp your minimalist style one bit. Keep things business as usual with a slouchy striped tee, streamlined black skinny jeans and of-the-moment slides (I actually want to snag these for myself!) Last step: Add some pep to your step by fastening a festive green hair tie around your ponytail or braid. What will you be wearing for St. Patrick’s Day? Leave a comment below! PS: For more green sartorial inspo, check out my article, 18 Green Dresses to Wear on St. Patrick's Day (+ All Spring Long). Love these outfits SO much! They're gorgeous. My favorites are definitely the striped dress and the striped top!